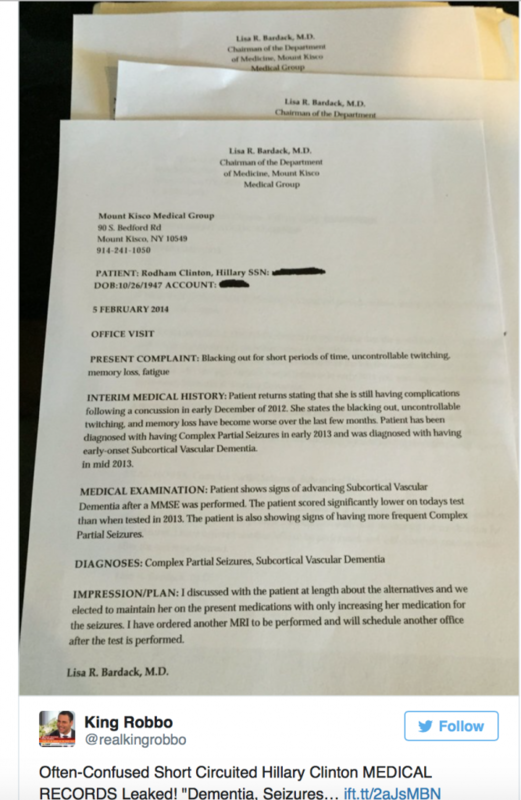 Were Hillary Clinton’s medical records leaked to the public? Is Hillary Clinton really suffering from dementia, seizures and memory loss? A new report indicates that Hillary Clinton’s medical records have been leaked, but not everyone agrees. Are the medical records fact or fiction? While the general consensus is the leaked medical records are fake, there is a bit of truth behind them. The doctor named on the medical reports has been confirmed as one of Hillary’s doctors: Lisa R. Bardack. Still, not everyone is convinced the medical records are fake. The following is a CBS News report from December 2013 reporting on Clinton’s health issues from 2012. Mentioned are two blood clots Clinton has been diagnosed with. One clot Clinton suffered in the ’90s. The other blood clot she was diagnosed with was in Dec. 2012. In a ABC News report, it was discussed that Hillary Clinton did have additional issues stemming from the concussion. No one in Hillary Clinton’s camp would state what the additional issues or injuries she sustained were. Dr. Lisa R. Bardack released the document clearing Hillary Clinton to run for office. The statement of health was issued on July 28, 2015, and previously had been accessible through Scribd. Since the controversy and conspiracy theories surrounding Clinton’s health have escalated, the document’s settings have been changed to private. According to Dr. Bardack’s 2015 medical statement, Hillary Clinton was in excellent health, reported Time.